What did prehistoric people wear? It’s Wednesday, which means it’s the day I answer questions from you lovely folks. Today’s question comes from Laura, an English teacher who asks whether there are any resources out there that might help kids learn about prehistoric clothes (and also terrifies me that someone who knows how English is meant to work might read something I wrote). To the best of my knowledge, the answer is sadly no (although if any readers can offer something I missed, please do). There are very few human evolution resources aimed at kids in particular, that’s why I got so excited when Grandmother Fish showed up. As such the number of resources about specific aspects of the palaeolithic (such as clothing) is basically nil. So instead I decided to give a brief overview of our knowledge of cave-man clothing in the hope giving Laura a little bit of assistance with her teaching troubles. Unfortunately, when it comes to studying palaeolithic (stone age) clothes there is an even bigger problem than “nobody is writing books for kids about it”. Most clothes are made of organic material, like cotton, fur or animal skins. This sort of stuff decays over time, leaving almost no trace. Take a look in your wardrobe and imagine all the fabric rotting over 10,000 years and you’d wouldn’t be left with much. Luckily, you would be left with something. Zippers, belts, buttons and other bits and bobs might survive. These “accessories” are the only physical evidence of palaeolithic clothes we have left. They’re quite rare but when they are found they can be quite spectacular. Sungir is a Russian site dating to ~30,000 years ago where three graves were found: one adult and two children. They were buried with some amazing artefacts, including 6ft long mammoth ivory spears (that had been straightened, which seems like quite a task). However, the best bit was the >13,000 beads found wrapped around their bodies in the pattern of clothes; giving some hint of what they may have been wearing. Meanwhile in Italy at Arene Candide there’s “The Prince”, a skeleton dating to ~25,000 years ago with a “crown” made from hundreds of beads (and an elk antler “scepter”). There’s no clues as to whether he actually was royalty, although he did have a fairly rich diet full of sea food. However, the thousands of beads seen in these graves would’ve taken hundreds of man-hours to make. The sheer amount of effort involved suggests that these weren’t the regular clothes of palaeolithic people. Perhaps they were a ceremonial “Sunday best”. So to figure out the regular clothes of your typical cave man archaeologists have also been looking at what tools they had. After all, a group without a needle and thread is going to have a hard time making anything fancier than a fur poncho. Palaeolithic tools were made of bone, ivory and stone; so should survive a lot longer than the clothes they were actually being used to make. And sure enough dozens of such tools have been made, from lissoirs (used to prepare animal hides and make them more waterproof) to the pieces needed for weaving and sewing and more (all dating to around the same time as Sungir and the prince). Taken together these suggest that palaeolithic humans were great tailors, capable of sewing together waterproof animal skins into well-fitting garments. Archaeologists have also found imprints on clay that confirm they actually using their sewing and weaving tools for sewing and weaving. 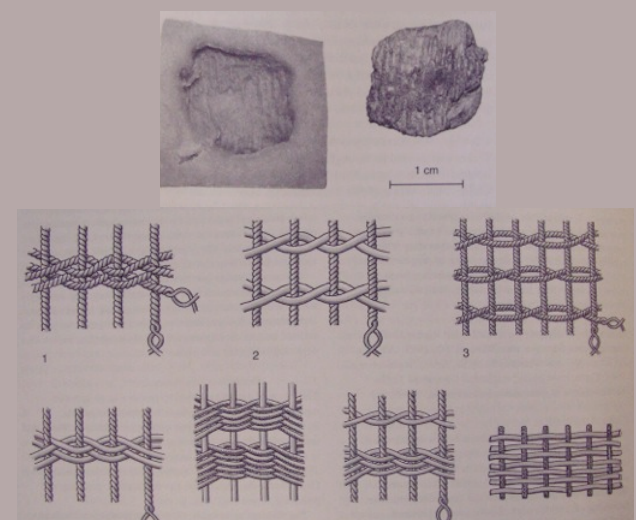 Indents of textiles, some with seams, have been discovered on clay fragments in the Czech Republic (and also dating to the same time period) showing palaeolithic humans could make very high quality clothes. But of course, all these discoveries only deal with stuff around 30,000 years ago. Homo sapiens have been around for about 195,000 years. What were we wearing then? And what of all the other species of human, like Neanderthals? Sadly it’s even harder to answer these questions as the archaeological record for these periods is quite patchy. Simulations show they had to be wearing something, it was just too cold to go without clothes (even revealing they needed hats). And we’ve found some of the tailoring tools in Neanderthal camps (including some cases of tools that they seem to have taught us how to make. Impressive for “dumb” Neanderthals). However, the Neanderthals were missing some of the key tools needed to sew things together. So their clothes were likely ill-fitting and only used existing materials, rather than weaving stuff together like humans. However, they did have awls which could be used to punch holes in leather (and then lace it together) so they weren’t restricted to wearing rags. They could combine fabric to make clothes, but this method was still “clumsier” than sewing.So it would seem humans have been trend-setting tailors for 30,000 years; if not more. Prehistoric people were capable of weaving textiles and sewing them together to make good fitting clothes from many materials. Some of them they decorated with an absurd amount of beads. Neanderthals were also not half bad, although couldn’t hold a candle to humans on the catwalk. I hope that was helpful. Didn’t Neandertals have awls, so they could be lacing rather than sewing? They did have awls, which could punch holes in materials for lacing. But such a process would still be relatively clumsy compared to sewing so I think their clothes still wouldn’t be quite as good. However, looking back over the post that does seem like a bit of an omission, so I’ve added in mention of the awls. I’m not sure you are thinking about the tailoring problem correctly. Animal skins come pre-curved to fit bodies. Human carnivores might know who to go shopping for when a new hat or jacket is in order, thereby minimizing the effort required for assembly/lacing/sewing. The donating animals wouldn’t be bipeds, so arms and legs might require reassembly, but some tricks were probably learned in 40000 or so years of practice. .
Arms and legs would requires assembly, and the rest of them would likely require work as well to ensure they had the tight fit needed to keep out the cold. Just look at some modern hunter-gatherer groups – particularly those that lived in colder climates – who make clothes out of furs yet still have to do a lot of preparation to make them suitable.